Donald Trump, as reported in Bob Woodward’s new book “Fear: Trump in the White House”, told Gary Cohn, the Director of the National Economic Council, to just “run the presses– print more money” when addressing the insurmountable US Federal Debt. Donald Trump, the same man who ran a campaign to the White House that pledged to “eliminate the [$19 trillion national] debt over a period of eight years”, thinks we can print our way out of this mess. Bob Woodward, an investigative journalist and Editor at the Washington Post since back in the Nixon days of 1971, wrote a full book exposure of the Trump White House in comparison to the other administrations he’s seen in his tenure at WaPo. In the book, Woodward describes a back-and-forth between the National Economic Council and Trump that is truly telling of how out of the loop President Trump is. While the book dates the quotes and conversations back to 2015 and 2016 during his campaign, it is hard to believe the stances on this economic issue have changed in the slightest. With the signing of reckless spending bills and omnibus budgets that only increase the forecast of US government expenditures, it is clear that President Trump is all talk and no walk on the subject of the current economic crisis that is the National debt. Whether or not it was already known that Trump’s words bleed insincerity when it comes to spending cuts or a balanced US checkbook, it is evident now that the current POTUS has no viable long-term solution for the issue, which could cause the worst depression yet. His “solution” if it could be considered as such, of printing more money to offset the effects of the ever-growing now $21 trillion national debt is not just infeasible, but is admittedly extremely popular in Washington D.C. and the White House itself, with past Presidencies. We see in the Obama administration, the idea of printing more money caught wildfire throughout the EU and G-20 with direction by former President Obama himself. In fact, there was a specific occasion during a G-20 meeting where Obama and Biden called on Angela Merkel of Germany to start “pulling their weight in the global effort of economic stability” by “printing” more money. As much of an oxymoron as that sounds to even the most amateur economist, it is a legitimate belief that has spiraled many countries to insurmountable debt. The principles of economics rest on responsibility with the money you own. It would be foolish for the average person to go out and buy a $350 Xbox One when after my checkbook is cleared, I only have $150 to spend. Why do we not ask this much culpability from our Federal Government? It all started back in the days of Woodrow Wilson, and the creation of the Federal Reserve as an entity itself in 1917. The overarching power of a central bank to be the authority on all things money related can be a powerful responsibility, and in most times, a detriment to the economy it attaches itself to. Before the creation of the Federal Reserve, only $20 billion in debt had accumulated in the years after the Civil War. When adjusted to inflation, this comes out to around $51.7 billion, just barely 25 percent of what the US National Debt is today. Since then, we’ve seen the ability to print money used as a weapon to over tax citizens, and justify wars overseas where the US frankly should not be involved in at all. In the case of George W. Bush, the National Debt was increased 101%, tacking on $5.849 trillion to pay for the (ongoing) War on Terror in Afghanistan and Iraq. Military expenses rose to all-time highs, and when the US taxpayers couldn’t chip in the yearly $600-800 billion necessary to fund it, Bush and the Federal Reserve created the money out of thin air to respond to the 9/11 attacks over a span of 8 years that hasn’t stopped since. When will we be done with this intervention? The question has yet to be answered, and President Trump hasn’t made progress in that regard either. Bad economic habits and fiscal irresponsibility is prevalent across the board, no matter party denomination. President Obama raised the debt 74% in his tenure in the White House, adding $8.588 trillion from fiscal years 2008-2016. Whereas Bush picked his poison with military spending, Obama focused more on tax cuts, unemployment benefits, and public works projects to recklessly spend more money than the US Government could even think about obtaining. That’s not to say that Obama didn’t have his fair share of military spending checks sent to the Department of Defense consisting of artificially printed money, because the War on Terror persisted throughout his Presidency as well. These bad values will lead us to the next depression at the expense of the taxpayer and common folk, while the people who got us in this mess leave untouched. The economy will crash in the event of Trump printing more money to stabilize the National Debt, and it won’t be a small recession. We will see the closing of businesses as the value of the US dollar declines, leading to lower imports and exports, and a shortage of goods in the US market. With all of this leading to a disaster, we beg the question: Why aren’t we holding these government workers to higher standards? After all, they clearly aren’t looking out for our best interests. On his campaign trail, Trump vowed to be the change in the government bureaucracy that is Washington D.C., but he clearly can’t live up to that. As the Trump-Russia collusion conspiracy theory has, via lack of evidence, all but withered away, it is time to set the record straight on Russia’s involvement in the 2016 election. What many dramatically refer to as an attack on our democracy or even an act of war was actually closer to a non-event that U.S. foreign policy is to blame for. Instead of fear, anger, or hostility, we should react to Russia’s alleged involvement in the 2016 election with empathy, pity, and national self-reflection. In an ideal world, the Kremlin and the U.S. federal government would be mutually respectful allies, In this reality, American and Russian people would engage in commerce with each other freely. But we do not live in an ideal world. We live in a world in which both governments’ choices have inculcated Americans and Russians with different languages, cultures, values, and fears. Because of this, it may be impossible for the US and Russia to ever eliminate hostilities wholesale and create a live-and-let-live type of atmosphere. Even so, a Washingtonian/Jeffersonian foreign policy is our best and safest bet. Instead of getting caught up in entangling alliances, we should seek to make the best of an imperfect world. To do so, we must accept countries for what they are, imperfect. Thus, we should allow people of both countries to seek roads to happiness and prosperity when they see fit. What Will This New Direction Look Like? Instead of sanctioning Russia and allowing NATO to usurp our national interests, we should knock down any roadblocks in our trade routes that we have the power to. If Russia reciprocates, great. If they don’t, our liberal policies will serve to the betterment of all anyway. Two wrongs don’t make a right. I empathize with the heart of neoconservative foreign policy. The way I see it, it refuses to stand idly by as major human rights violations occur. Admittedly, there is virtue in universal recognition of the individualist philosophy that our forefathers preached, and in seeking to approach foreign affairs this way. Whether you support the Neoconservative tendency towards caution or the Libertarian preference for sovereignty, such an immense military presence around Russia is going to have consequences. These may include, but are not limited to, intimidating military exercises, expansion of territory via brute force, increased centralized control over the flow of information internally, and a greater focus on collecting intelligence from adversaries. It should be no surprise that the Russian government engages in all of these defensive practices. The counter to this claim could be that the consequences of the U.S. and its NATO allies easing up would be even worse. One might say that the only reason Russia has been so meek in its hostilities is due to the current robust military presence. This is a chicken or the egg dilemma that I cannot solve, but, for the sake of argument, I will give the benefit of the doubt to the neocons and concede that western military might in some form is needed to keep Russia at bay. Accordingly, we must accept the consequences of this choice, one of which is Russian intelligence agencies seeking information and causing disruptions, i.e. their involvement in the 2016 US election. From what I understand, the extent of Russia’s “meddling” in the 2016 US election does not amount to much. Based on the latest indictments brought by the Mueller investigation, Russian military intelligence operatives may have tried to hack the DNC’s server to expose information about Hillary Clinton. 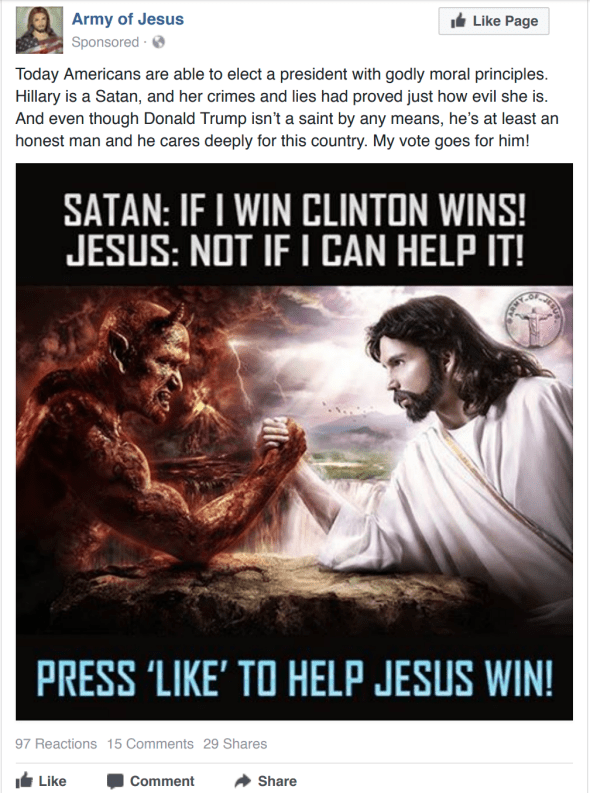 Previous indictments allege that Russians may have purchased Facebook ads aimed at sowing discord within the American public (not simply backing Donald Trump for president, as many lazy and/or biased media outlets continue to assert). On hacking, I am not convinced that the Russians are responsible. As the race in the Democratic Party between Hillary Clinton and Bernie Sanders was extremely divisive and contentious, it would be unsurprising to find out that various pro-Bernie members of the DNC with access to various servers decided to leak damaging documents about Clinton and her campaign. The motivation makes sense, and so do the logistics. It would have been far easier to get inside and download files at close proximity than from Russia. “On the evening of July 5, 2016, 1,976 megabytes of data were downloaded from the DNC’s server. The operation took 87 seconds. This yields a transfer rate of 22.7 megabytes per second. “These statistics are matters of record and essential to disproving the hack theory. No Internet service provider, such as a hacker would have had to use in mid-2016, was capable of downloading data at this speed. Compounding this contradiction, Guccifer claimed to have run his hack from Romania, which, for numerous reasons technically called delivery overheads, would slow down the speed of a hack even further from maximum achievable speeds. This forensic evidence, combined with Occam’s Razor, makes it difficult for me to accept the accusation of Russian hacking at all, no matter how many US intelligence agencies say otherwise. I am not saying that the Seth Rich conspiracy theory is likely to be true, but I find it equally as persuasive as the Russian hacking theory. The indictments of the Russian operatives accused of hacking the DNC server will not result in extradition or trial, so the accusations will never be tested in a court of law. And some of the most fundamental pillars of reason, liberty, and the Bill of Rights dictate that we cannot accept claims ad verecundiam. In fact, it is assertions from those in power, like the FBI and NSA, we must cast the most doubt upon. The indicted Russians are not guilty until proven guilty beyond a reasonable doubt. It would be nice to have a civil libertarian organization like the ACLU actively reminding us of these things, but identity politics and Trump hatred have resulted in many such groups losing their way. Beyond all this, the documents released by Wikileaks provided the public with more truthful information, which is most certainly a positive development for the democratic process. For those who purport to care about an informed public determining their destinies via the vote, it would be quite hypocritical to claim otherwise. Bringing these facts to light in the current climate can result in accusations of treason as Senator Rand Paul has been subjected to. While this is to be expected when it comes to warmongering neoconservatives, hearing it from self-described liberals has a chilling effect. This sort of with-us-or-against-us, pseudo-patriotism is far more reminiscent of nazism than the enforcement of immigration law is. Did Russia Have Any Significance? Even with all of this accepted as fact, there continues to be zero proof that Russian “meddling” changed anyone’s vote. And there are monstrous hurdles one must overcome to prove the positive claim that Russia successfully influenced the 2016 election. The first is that the amount of money Russia allegedly spent on influencing the election is a drop in a bucket at the bottom of a massive sea of campaign financing and media coverage. Unbiased America illustrates the incredible disparity between Russian spending and non-Russia spending. The foreign nation accounts for about 0.1% of the total money spent on the election. And even without juxtaposing the amounts spent to influence the election, there is no scientific proof that campaign contact or advertisements can persuade voters in the first place. In a study published by Stanford University’s Graduate School of Business in 2017, researchers concluded that “the best estimate of the effects of campaign contact and advertising on Americans’ candidates’ choices in general elections is zero.” In other words, if you are looking to alter someone’s vote, it is going to take more than slogans, attack ads, and memes to do so. How did Trump Really Win? To sum up, any genuine hysteria over Russia’s involvement in the 2016 election is misguided. There is no reason to believe Russia affected the US election in any way of their own volition, nor that they broke any laws. Freedom of speech is a human right, not one reserved for everyone except those who have some distant connection to the Russian government. Human nature and far greater influences impeded any attempts to impact the election. And Russian meddling in U.S. affairs is a small price to pay for containing them (or, rather, bullying and threatening them). What should be of far greater concern to all Americans are reactions to the Trump-Russia narrative by individuals, the media, and especially the US government. Sanctions against Russia will harm the Russian people and strengthen its government. Already suffering from a lackluster economy, sanctions will further thin out their opportunities. On a global scale, sanctions and other barriers to trade create an invisible domino effect that hits sectors of economic activity around the world too. Growing economic anxiety and economic hostility from NATO combined with a global media that paint Trump as Russia’s lapdog will inevitably guide the Russian people deeper into the protecting arms of Vladimir Putin. Many members of the public and in Congress have called for increased regulation of the internet and social media as a way to prevent Russia from “meddling” in future elections, a dangerous undermining of free speech and expression no American should tolerate. Instead of making peace and harmony with Russia more difficult, we should accept the minor consequences of containing Russia or leave NATO and let Russia be. The men who fought off a bullying foreign nation to found the United States of America would have preferred the latter option.